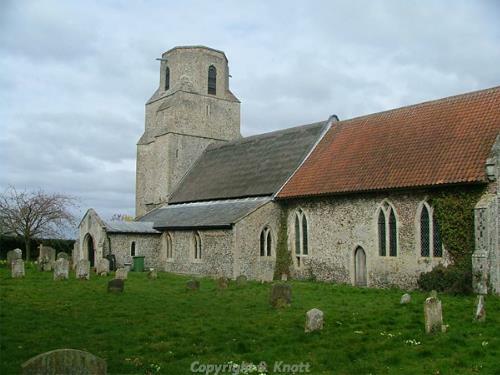 The parish of Scoulton is situated in the Breckland District of Norfolk. It lies to the south of Cranworth, east of Carbrooke and west of Hingham. The name Scoulton derives from the Old English meaning ‘Skuli’s farm’. The parish has a long history and was certainly well established by the time of the Norman Conquest, its population, land ownership and productive resources being detailed in the Domesday Book of 1086. The land was held by a freeman under Harold before 1066 but was a part of Ralph’s (de Toeni?) manor by 1086. The parish had woodland and various quantities of livestock were also mentioned. The earliest archaeological sites in Scoulton are prehistoric pot boilers scatters (NHER 8818 and 8819). These pot boilers would have been used to heat water for cooking and washing and may indicate areas of the landscape which were occupied during prehistory. In addition to these sites a number of prehistoric lithic implements have been found in the parish including several worked flint implements of Palaeolithic date (NHER 8800 and 8801). However, most of these prehistoric tools date to the Neolithic and take the form of flint axeheads (NHER 8803, 8804 and 8805). Many of these finds were found in the 19th century and as such their find locations are unknown. The only other finds or features from the prehistoric period in Scoulton date to the Bronze Age. A couple of ring ditches were discovered approximately 300m southwest of the poultry houses on the B1105 road (NHER 12382). These ring ditches and a double concentric ring ditch on Common Hill (NHER 8809) all probably date to this era. No Iron Age artefacts or sites have been discovered in Scoulton. This does not necessarily indicate a lack of activity during this period, as it is possible that Iron Age evidence merely awaits discovery. Similarly, there is a paucity of evidence relating to Scoulton’s Roman past. Aerial photographs taken in 1980 showed the cropmarks of parallel ditches belonging to a possible trackway (NHER 18322). This trackway appears to continue the line of a known Roman road and as such might be a feature of contemporary date. Sadly no Saxon finds or features have been reported for Scoulton, making it hard to comment on the nature of the parish during this time. Thankfully, there is a good deal more evidence relating to medieval Scoulton. Holy Trinity Church (NHER 8831) has medieval origins with the nave, chancel and aisles dating to around 1300. The tower was added later in 1340 and various other additions were made in the 15th century. The church underwent repairs in the 17th century. Inside, the church features an unusual Easter Sepulchre and a handsome trefoil piscina. Scoulton was home to a castle in the medieval period that was built by Constantine Mortimer under license of Edward II. The exact site is disputed but it is believed to have stood somewhere on the lands surrounding Abergavenny Farm. One possible site lies to the north and has an earthwork earthen enclosure (NHER 8808) whilst the other is a moated enclosure to the west of the farm (NHER 8809). Nevertheless it is interesting to note that the parish was important enough to warrant castle construction. All the other medieval features that have been noted were identified from cropmarks/soilmarks visible on aerial photographs. The purpose of most of these enclosures and ditches has not been ascertained but a number of tofts and agricultural marks have been determined (NHER 17695). In spite of the presence of these interesting buildings and features very few medieval artefacts have been recovered. Those that have been found tend to be pottery sherds or roof tiles from the old church roof and as such merit little further discussion. The post medieval period in Scoulton is characterised by farmhouses and barns. A typical example is Wayland Farm House (NHER 46135), on Shipdham Road, which dates to the early 19th century. This large building stands two storeys high and has eight irregular bays. This farmhouse has an associated barn of similar date (NHER 46524). The barn is of a traditional construction type and has full height double doors and diamond ventilation panels to the right and left. In contrast to Wayland Farm, Tollhouse Farm (NHER 18090) is a more unusual building. This former tollhouse survives in good condition and is notable for its tall chimney. Visitors to Scoulton should also take note of two charmingly named properties that line The Street. Frogsabode (NHER 35890) is a timber-framed house dating to the early 17th century, whereas Toad Hall (NHER 35889) is a thatched cottage dating to the later 17th century. Both these buildings have been subject to recent modifications and seem to have been high quality original constructions. The final building of this era in the parish to be mentioned is Scoulton Hall (NHER 46522). This house dates to the mid 19th century. It is made from brick with corrugated tiles and slate roofing with a dentiled eaves cornice and two multiple shafted chimneystacks. The most recent archaeological record for Scoulton relates to World War Two. A Type 22c pillbox (NHER 32425) stands to the west of Clipbush Lane, around 400m northwest of the New Cottages. It is clear that the pillbox was not the only defence to be placed here as a 1946 RAF aerial photograph shows a searchlight battery as well as possible machine-gun and anti aircraft emplacements extending to the west of the pillbox.